www.Teo-Education.Com » Polytechnic and Vocational Education. Tun Juhar (centre) with Ismail (second left), Zainab (second right) and the management team of Kota Kinabalu Politeknik. 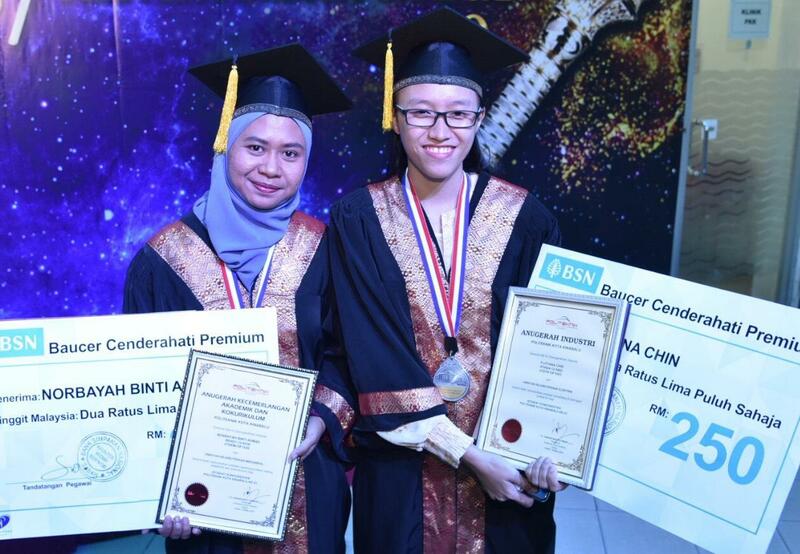 KOTA KINABALU: Despite the stereotype that boys do better in technical and vocational studies, girls have achieved highest grades in all four diploma courses during the morning session of Politeknik Kota Kinabalu 23rd Convocation, yesterday. Norbayah Ahmad, 28, who received an excellent award for her diploma in mechanical engineering, said achieving good result in academic and co-curriculum required realistic goals. “As for me, I have been through so many challanges in life, where I have to stop schooling when I was in Form Four due to personal matter. “After seven years away from school, I came back with a goal. I want to be an educator. My mission was clear and I want to achieve it. I took my SPM in 2014 but my result was not good enough for me to register in a teacher’s college. “In 2015, I decided to pursue my study in Kota Kinabalu Politeknik and aimed for the best student award, which I did. “Today, I am doing my degree in Technical University of Malaysia in Malacca and I am planning to be a lecturer. I am confident that I am half way there,” she said. Norbayah, who is from Telipok, said although mechanical engineering is often related to boys, the course is actually suitable for everyone despite their gender because machanical engineering is basically to discover how things work. “As women, we don’t have to compete with men. We have to compete with ourselves and be a better version every single day,” she said. As for Tamparuli girl Floyana Chin who received an industrial award for being an excellent trainee during her industrial training, her responsibility as the eldest of three siblings was the main reason for her to perform well. “My other siblings and I were raised by a single mother. I witnessed my mother struggling with her day job as a teacher and full-time parent. It was not easy, I know. “I have no option but to do good in studies, get a job and help my mother to support my other siblings,” she said. Floyana, who is currently working in Petaling Jaya as a junior programmer said she showed her appreciation by giving her first salary to her mother. “Living in big city like Petaling Jaya is not easy because the cost is high, but I am grateful for this opportunity. I will gain a lot of experience to allow me to contribute to the industry in Sabah. “I also hope more Sabahans will start looking at skills and technical institutions as their choice because there are so many opportunities in this line,” she said. 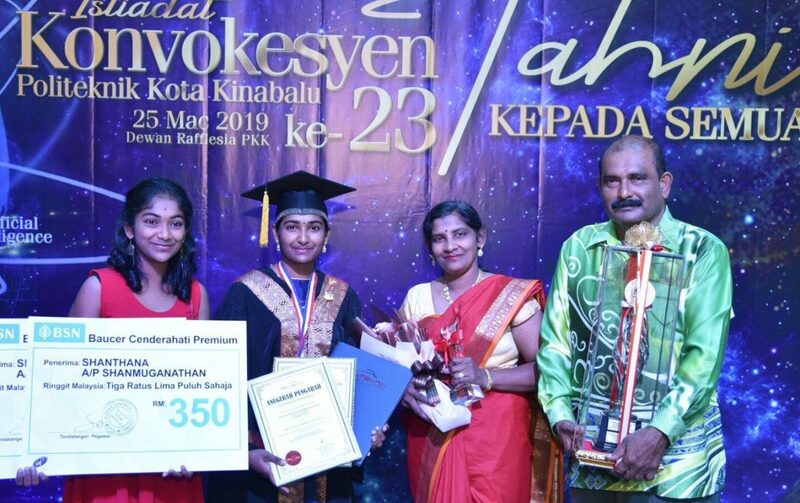 Shanthana Shanmuganatan, who received the Politeknik Director Award, said she always maintained good relationship with lecturers because it was easier for her to ask questions and involved in various activities. Shanthana (second left) and her family members. “Since I am from Selangor, I don’t have family here. I only have friends and lecturers, so I can focus on co-curriculum. I have the best experience studying here, and I’m glad choosing Sabah for my diploma course. “I am currently working as a service associate at front office department, Pulse Grande Hotel in Putrajaya and I enjoyed working there. “I will continue working for more experience and will see if there is a bigger opportunity in the future,” she added. Sabah Head of State, Tun Juhar Mahiruddin handed over all the scrolls during the first session. During his opening speech, Juhar expressed his appreciation for the excellent performance of Politeknik Kota Kinabalu as a Technical Vocational Education and Training (TVET) centre in the state. He said the increase of employability from 93.5 percent in 2017 to 95 percent in 2018 showed that the institution was on the right track producing skilled workers that were needed by the industry. Presently, qualifications for academic (higher education) and vocational education offered by universities, polytechnics and community colleges under the ministry are accredited by the Malaysian Qualifications Agency (MQA), whereas programmes offered by skills training institutions are accredited by the Department for Skill Development of the Human Resources Ministry. While the allocated sum for the fund was lauded by TVET providers such as polytechnics, community colleges and technical and vocational colleges as well as industry players, they also expressed their concerns. Polytechnic and Community College Education Department senior director Zainab Ahmad stressed that the TVET fund is not enough to leverage on. “Public TVET institutions are not rich organisations. Year after year, we are doing more with less budget allocation, spending more on operations and development. “It is for us to come up with new curricula to stay relevant to cater to industry demand. However, we also need up-to-date and top-notch equipment, facilities and machineries for the students. Sometimes, we don’t have enough for maintenance or even our day-to-day operational costs,” she said. “With the TVET fund, we need to allocate for training programmes as well as teaching and learning at 36 polytechnics and 102 community colleges nationwide. “But we have the passion to nurture our students,” she added. The department is aware that the industry must come first, hence it sets curricula that meet MQA requirements. Kolej Vokasional Ekonomi Rumah Tangga (ERT) Setapak director Nor A’idah Johari is hopeful that vocational colleges will also get an allocation from the fund. “We have 90 vocational colleges throughout the country including Sabah and Sarawak. We need to value add our facilities and infrastructure. “At ERT Setapak, we are focused on upgrading our industrial kitchen and sewing machines so that students will experience the real world environment similar to hotels and the fashion industry. “For example, our aim is one fashion student, one machine so that they know the tools of their trade,” said Nor A’idah. University Teknologi Malaysia Corporate Fellow (UTM-Malaysia Petroleum Resources Corporation) Institute for Oil and Gas Adjunct Professor Zulkifli Abd Rani said as the government has a vision to create a 60 per cent TVET workforce by 2020 in line with the country’s aspirations to emerge as a developed nation, a dedicated and right funding is essential. “The TVET fund is timely as without a dedicated fund, nothing will move effectively and efficiently. In addition, the management of the fund must be given the utmost attention by all parties involved in TVET enhancement,” added Zulkifli. Zulkifli, who is Techno Diverge Link Sdn Bhd managing director, said the acronym TVET also stands for Towards Victory in Educational Transformation—the reform of the TVET education system in line with the aspiration of the New Malaysia government. “We need to ensure that 20 per cent is spent on planning and 80 per cent on execution with 100 per cent commitment on follow-up correction and proactive enhancement. “Some may argue that the RM30 million allocation for the TVET fund is not enough. But it is an opportunity to work together smartly as one team with common objectives to come up with the desired programmes to meet TVET deliverables with the allocated fund. “It is better than nothing. We need to ensure the right integration and seamless interface between various key ministries involved in TVET programmes under the purview of the newly set up TVET Coordination Committee led by Nurul Izzah Anwar. Professional members representing regulators from the government, academicians from polytechnics/universities, industry technocrats and consultants as well as non-governmental organisations representatives must be brought in,” added Zulkifli. Apart from the restructuring and transformation of TVET training programmes, key stakeholders such as the government, polytechnics and the industry need to align and chart the way forward on areas of priority for the courses. The landscape of the industry has changed rapidly and tremendously over the last few years. The industry needs highly skilled TVET graduates with leadership qualities and a good command of English. Zulkifli said: “The overall framework on restructuring and transforming TVET training programmes needs to be revisited to reflect the current landscape of key relevant industries. “The programmes need to address the country’s dependency on foreign workers especially in the skilled job categories. “We must also recognise the shift of the industry from labour-intensive to knowledge-and-innovation-based-economic activities. TVET institutions must be equipped with the state-of-the-art technologies to expose both lecturers and students to the real world. At a forum and dialogue session titled Building a Brighter Talent through TVET at the one-day National Industry Dialogue 2018: Living Skills in the 21st Century: TVET Empowerment, Zainab added: “At the Polytechnic and Community College Education Department, we try our best to take care of all the institutions under us — after all ‘poly’ connotes ‘many’ and there’s the ‘community’. “We are at the crossroads of the old and new TVET mindsets. “In addition to industry demand, we also have to cater to parents’ wants for their children. Society and the industry have high expectations of TVET institutions. The retail sector is a good area for vocational graduates. “If they dream big, they may own their own businesses one day. The younger generation is IT-savvy and this gives them the chance to work on the Internet of Things open source networking so the country can go global. “The majority of lecturers in polytechnics are from the engineering and technology fields. We also have a strong foundation in electronics and electrical and mechanical engineering to embrace the Fourth Industrial Revolution. The transformation of vocational education, which began in 2013, has spurred the trend in the education scene in the country. This transformation has promulgated a shortcut for students to get their diploma qualification at vocational colleges after they finish Form Three. Indeed the expansion of the vocational stream in the education system has been practised in many countries as the number of students gets bigger in line with technological advancement and economic demands of a particular country. TVET also aims to produce a labour force competent in certain areas, hence internationalisation is one of the platforms to expose students and lecturers to the development of TVET abroad. Nor A’idah said TVET students compete on the international stage and TVET institutions partner with industries and foreign universities to gain exposure. Recently a delegation from vocational colleges went to China to look into internationalisation programmes. “We visited colleges in Beijing that offer technical courses similar to our vocational programmes in Malaysia. “The visit also opens up an opportunity for students to learn about living and learning abroad through dialogue sessions with the Malaysian Students Association in Beijing during the campus tour,” she added. The visit was also designed to look at pedagogical practices of Malay Language Studies at Beijing Foreign Studies University. “Students and lecturers also explored the learning environment and the use of technology and equipment at schools that offer skill-based courses in Beijing. Nordin (left) and Sailanathan speak on the TVET issue. NON-GOVERNMENTAL organisations, experts, academics and stakeholders have come together to form a body called the National Movement of TVET (Technical and Vocational Education Training) Empowerment. The movement has devised a national framework for the betterment of TVET. “We hope to propose this framework to the Government in the coming weeks. “Some of the parties involved in the movement include the Federation of JPK Accredited Centres (FeMac), National Council of Professors and the National Parent-Teacher Associations’ Vocational and Technical Consultative Council. “The crisis that has befallen it isn’t about our training model not meeting international standards but its structural governance,” said FeMAC honorary advisor Nordin Abdul Malek. Nordin said it is imperative for relevant ministries to meet stakeholders and plan the future of TVET. FeMAC is an association comprising members who are accredited TVET training providers. Currently, there are over 350 accredited centres in the country registered with it as members. One of the aspects put forward in the proposal by the movement is for the Government to be clear on TVET’s funding mechanism. “In the future, we don’t want the Government to depend only on the Skills Development Fund Corporation (PTPK) but instead, on CSR funds as well as contributions from government-linked companies and industries,” he added. FeMAC president P. Sailanathan outlined several pivotal issues affecting TVET. “Currently, we don’t have a representative from FeMAC in the PTPK board. “If stakeholders are not represented in the board, who else will then speak on behalf of the private sector?” he asked. Sailanathan also called for transparency in the funding of PTPK loans, saying it should be independent and for it to function like the National Higher Education Fund Corporation (PTPTN). Between 2015 and 2018, PTPK loans have been cut by 60%. “It should come under the Finance Ministry where there is no quota. “Every student who applies for a PTPTN loan will receive some amount of money for their education. Sharing an example, Sailanathan said when an accredited centre with 400 students, for example, applies for loans, PTPK often only has enough funding quota for 100 students, due to the limitation of funds. Therefore, the funding mechanism should be seamless like PTPTN, he added. FeMAC hopes Human Resource Minister M Kula Segaran can meet stakeholders. “We want to know whether we are and will be relevant as we currently have no clear guideline for the next five years. Give Malaysian TVET trainers opportunities as we have capable trainers, Sailanathan added. He was commenting on Kula Segaran’s recent announcement on the Government’s plans to recruit trainers from India and Ukraine to train Malaysian TVET trainers. (File pix) Mohd Hazzerwan Mohd Hazzlee is collaborating with big names in fashion. For many students, tertiary education is the ticket to good jobs, opening up opportunities to be successful in life. Parents, teachers and society in general have ingrained this in children from a young age. To graduate with a degree, students spend years learning in class which may leave them little time for internships to gain experience at the workplace. But in today’s competitive job market, practical experience is the number one quality employers look for in hires. Although tertiary education has always been the top choice for many students, technical and vocational education and training (Tvet) offers a compelling career path especially for Sijil Pelajaran Malaysia (SPM) school-leavers. 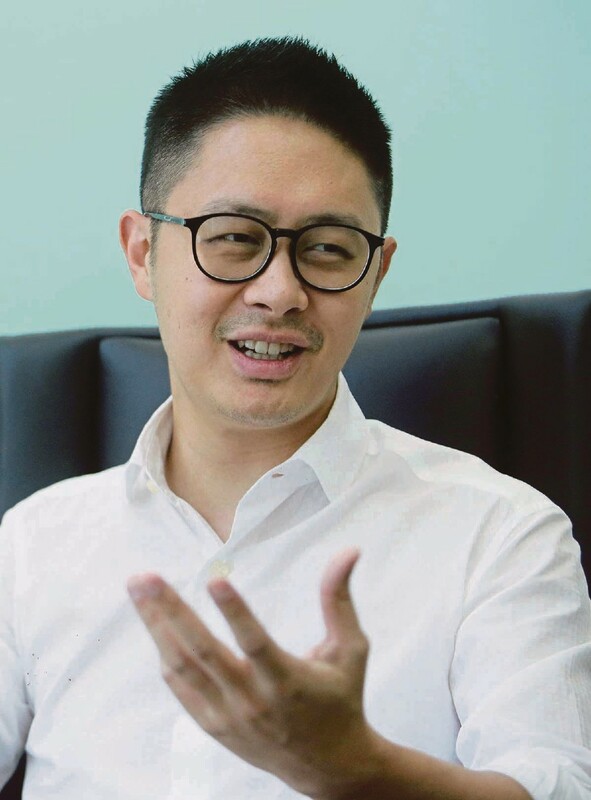 Tvet graduate Mohd Hazzerwan Mohd Hazzlee, co-founder and creative director of Wan & Mary, said a vocational college education has helped him to realise his dream. The collection consists of arts and cultural elements which mix high fashion with street fashion to meet current trends. Mohd Hazzerwan later pursued the Degree in Fashion design course at Heriot Watt university of Edinburgh, United Kingdom. “At first I was a bit hesitant to apply for the fashion course at KKTMR as the institution was new then and was taking in its first batch of students. But I am glad I took a chance. Having recently won a prize of RM100,000 in Gen F (generasi Fesyen), a programme for budding fashion designers, Mohd Hazzerwan is collaborating with big names in fashion. He is excited at his latest partnership with Fashion valet for its ready-to-wear collection. He is also preparing to make his debut at International Fashion Week next year in either London, Paris or Milan. There has been growing concern over the rate of employability among fresh graduates, be it from local or private institutions. Students today may aspire to professions which may not be relevant to the country’s needs. This may be due to lack of exposure and knowledge on the economic outlook in the country. Nevertheless, students have to plan their careers carefully. TVET programmes are often deemed inferior to courses offered by private and local universities. It is unfortunate that there seems to be a stigma attached to those who pursue TVET. The younger generation needs to realise the importance of TVET and regard it as a viable pathway. Associate Professor Dr Mohamad Sattar Rasul from the Department of Learning and Teaching Innovation (Technical and Vocational Education/Engineering Education) at Universiti Kebangsaan Malaysia’s Faculty of Education said that this misconception of TVET is common among low academic achievers. “We have heard success stories and achievements of TVET graduates who may earn more than degree holders,” he commented, adding that a teacher’s role is imperative to see TVET in a new light. “It is essential to expose secondary school teachers to the TVET educational framework and career path. Teachers have to stop regarding TVET as the second or last option for SPM school-leavers. “Our country’s TVET framework is unique where students have many course options. Those who do not do well academically have the chance to pursue higher education regardless of their SPM results. The country needs a skilled workforce and innovators who possess a high creativity in utilising its resources for manufacturing and produce good services to compete globally. CKL Group of Companies, which is best known for its Lim Tayar car service centres, established School of Skills (SoS) to meet industrial need for local experts and skilled labour in the automotive industry. SoS aims to instil its students with real-world experience, ready for the workplace. CKL Group of Companies, executive director Clement Lim said that SoS is important to produce skilled workers in the automotive sector. “SoS acts as a self-mitigation tool for the company to alleviate dependency on foreign workers. We hope to nurture more talents and hone quality recruits for the industry. SoS training department head Daneshwaran Krishnasamy said trained experts in all fields are in demand in the country. “Our programmes boost skills and the workforce in the automotive field. By doing something practical and hands-on, we are able to draw out students’ interest easily. Many of our students, who did not perform well academically, are passionate when it comes to practical training. “This industry is lacking in manpower. I used to work at BMW car services where the technicians were highly paid. Some were confident enough to leave and set up their own workshops for premium cars. “The biggest advantage of SoS is its workshop where students spend most of their training hours. However, this school is not for Lim Tayar alone. After finishing their advanced diploma, students can apply for internships at any automotive workshops in the country,” he added. SoS offers theoretical and practical training, and the work-integrated Train and Place programme, which involves four months of classroom-based learning followed by eight months of industry exposure. Generally, students go through 11 years of academic-based primary and secondary education. Students who are not academically inclined can opt for vocational college as early as 16 years old upon completing Form Three. Aiman Hakeem Aminuddin decided not to follow the mainstream path of applying to university despite scoring 8As in the SPM examination. The MRSM Tun Ghaffar student enrolled in the Diploma in Light Vehicle Maintenance course at SoS instead. “I chose to pursue a TVET programme because I realised that picking up a skill benefits me in many ways, not only for future job prospects but also in my daily life. “My family and I were going back to our hometown when the car tyre was punctured. Having learnt the skills in my diploma course, I was able to change the tyre without help,” he said. “My parents convinced me to pursue a TVET programme. When the results for university applications were released, I did not even check mine as I was determined to study at a vocational college. 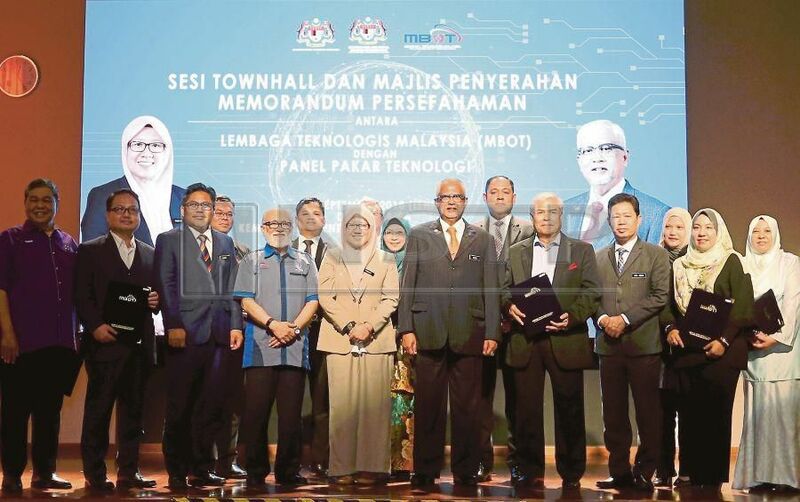 Mahfuz said in supporting the country’s aspiration towards Industrial Revolution 4.0, MBOT is seen asadynamic and flexible professional body and most relevant platform to leverage expertise and skills from various areas of technology under its wings. “This advanced technological elements are pervasively embedded into the TVET curricular right up to the technological practicing provision, to add value to the various booming industrial sectors in Malaysia,” he said. 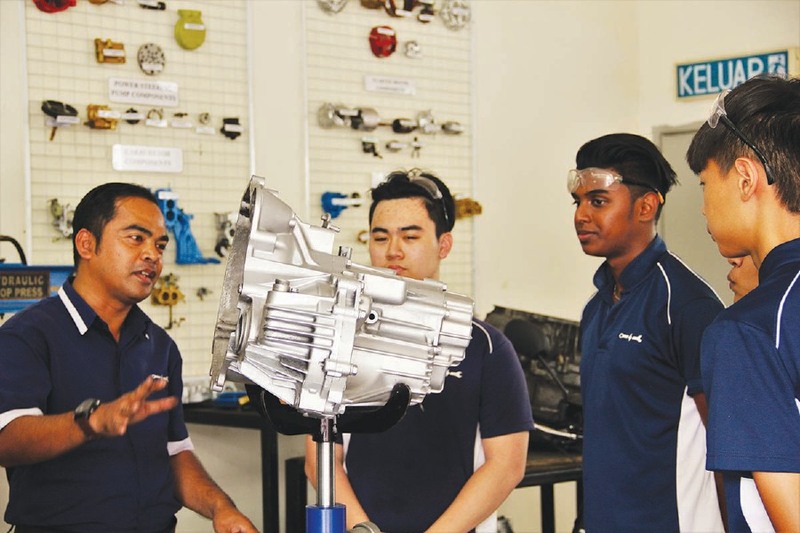 School of Skills head trainer Daneshwaran Krishnasamy (left) explaining to students the inner functions of a motor engine. IN coping with today’s competitive job market, students have to plan their future and career aspirations carefully. Technical and Vocational Education and Training (TVET) programme is an option worth noting, although often seen as inferior to programmes offered by other tertiary education institutions. The perception that TVET is only for students who do not excel in their studies has completely changed today. TVET is relevant as it involves education and hands-on job training, which provide knowledge and skills for employment. People are starting to realise its importance and are opting for vocational courses to gain skills in different fields. TVET prepares students with specific skills for a specific job, thus, making employment easier as they are trained and equipped with the right skills. This gives TVET graduates an advantage in the job market compared with fresh college graduates, who may not have the relevant skills for the working industry. Realising the deficit in the supply of skilled labour in the local automotive industry, CKL group launched the School of Skills (SoS), that provides vocational training for youths to fulfil the automotive industry’s need for skilled labour. Executive director of CKL Group Companies, Clement Lim. With the changes arising from economic and social development, this country requires a worker to be well trained in technical and professional skills. This is what SoS aspires to do — to groom its students with a real-world experience for their future employment. SoS wants to further develop the vocational training offerings in Malaysia to build human capital, which has been proven to increase youth employment and benefit the industrial sector. CKL Group started off with Lim Tayar, a homegrown automotive retail service company in 1985. “This industry is a big market. We can guarantee a job placement for each of our student so they can put their obtained skills to work after finishing the programme,” he said. SoS Training Department head Daneshwaran Krishnasamy said picking up a skill is never a waste. “The number of cars is increasing every day. I believe we are lacking of professional manpower in this industry. This programme will boost the skills and workforce in automotive field as Malaysia is in demand of trained experts. “TVET will result in productive employment and act as an important factor in the country’s economic development,” he added. “The biggest advantage of SoS is that we have our own workshop, where students spend most of their training hours. After their advanced diploma, the students will go through a three-month internship at any of 20 Lim Tayar outlets or other automotive workshops in Malaysia. “However, students do not necessarily have to work with Lim Tayar once they graduate,” he said. Located in Setia Alam, the training centre offers theoretical and practical training and a work-integrated learning programme called “Train and Place”, which involves four months of classroom-based learning followed by eight months of industry exposure. Students attending a briefing with School of Skills trainer. “Additionally, students learn English communication skills, personal grooming and self-discipline as a part of their assessment. These are the skills that they need once the step into the industry,” said Lim. The school will introduce a new non-automotive programme — Electronic, Plumbing and Air-conditioning (EPAC) course starting next month. Lim said promoting SoS was a challenge as TVET programme was not the mainstream path for SPM school-leavers as compared with other education institutions. He believed that TVET ensured individuals were equipped with relevant skills and assured to a strong degree of employment. “There are many misconceptions about those who choose TVET as they are known as the blue-collared workers. However, their work prospects are high in demand and they can do the things that we can’t,” said Lim. “In Malaysia especially, there is no awareness on boosting the skill workforce although our country needs more of them. Some of them are earning a higher income than degree-holders,” he said. THE Asia Technical Vocational Education and Training (TVET) Forum 2018 recently concluded with Education Minister Dr Maszlee Malik promising to make it the first choice for students in Malaysia. Few countries have attracted a majority of their students to join a vocational track as their first choice. An exceptional case is Germany. I visited Germany last year as a TVET visiting professor. I believe the German students are attracted to TVET due to its first-class infrastructure, industry-driven curriculum and high employability. When visiting a German Berufsschule (vocational school); it was as if I was at a Technical University with first-class equipment, advanced technology and teachers with Masters’ degrees and craftsman qualifications. No wonder, German students are attracted to making this their first choice. Elite Meister High School in South Korea has attracted high-achievers to choose the vocational track because of its prestige. In the Fourth Industrial Revolution, the usage of smart robots, autonomous vehicles and Artificial Intelligence should be ubiquitous. Klaus Schwab, the founder of the World Economic Forum, asserts that the fourth industrial revolution will fundamentally alter the way we live, communicate, work and play. According to McClean (2018), it is estimated that 75% of future jobs will involve Science, Technology, Engineering and Mathematics (STEM) knowledge and skills. We will increasingly need workers who have critical thinking and problem-solving skills; have multidisciplinary and cross-cultural competencies; communication skills, and social, emotional, digital and vocational intelligences. In other words, a learner with multiple intelligences should be welcomed to join TVET. A Korn Ferry recent report shows that a major faux pas is imminent throughout the world. Demand for skilled workers will outstrip supply in most countries. On the global scale, the report has highlighted a global talent shortage of more than 85.2 million people by 2030. In the context of talent crunch, the shortage in Asia Pacific region could reach 12.3 million people and estimated US$4.23 trillion (RM17.46 trillion) of revenue loss by 2030 due to the talent deficit in certain sectors. Even companies that are using Artificial Intelligence and smart robots foresee a growing need for human talent with advance intelligent skills. The Korn Ferry report shows that 67% of CEOs believe that advanced technology is critical for companies’ growth. The gap between TVET and industry should be reduced. Lack of specific legislation in Malaysia that requires companies to shoulder training hand-in-hand with the public vocational training institutions as in Germany is evident. Since 1969, Germany’s Federal Legislation makes it compulsory for industry involvement in Vocational Education and Training. As a TVET expert, I admire the German Vocational Education and Training System because of its focus on quality without any political interference. Excellence in any system requires two things: quality and merit. We need a critical mass of intelligent-workers who are using cutting edge technologies. Malaysia should also become a magnet for attracting the best foreign talent. But more importantly, the government should be mindful of its citizens’ employability in the context of the global talent market. It is essential that TVET institutions and industry invest in intelligent skilled talent, first-class infrastructure and provide continued access to both formal and on-the-job training opportunities. In this sense, the government should embrace more flexible education and training eco-system and labour laws. Generation Z or millennials will make up 60% of the workforce by 2020. These techno-junkies and Wifi generation prefer an interactive approach to learning, which blends information through a montage of images, icons, sound, video, animation and Artificial Intelligence. Gen Zs take advantage of the enormous resources of the cyberspace by using digital technologies to create something innovative. Unless teachers possess digital intelligence and skills, Gen Zs will get bored. Educators have to adjust their teaching styles to accommodate the psyche of Gen-Tech. A new digital pedagogy is required. In the digital age, to accommodate the expectations of the Gen Zs, educators need to possess digital intelligence, digital literacy, creative thinking, agility and flexibility. The future of education will be more virtual, mobile, interactive, personalised, dynamic and innovative. Digital learners prefer customised curriculum, instruction, and assessment. To embrace true digital transformation, the need for visionary, creativity, agility, flexibility and esprit de corps among teachers and learners is a must. SThe intelligent-based TVET model isn’t only about technology, it is about bringing together the power of innovation, a new culture and a new mindset that embraces the change brought by the Fourth Industrial Revolution. TVET has been rebranded several times in the past. They mostly focused on enhancing the quality of TVET talent and skills. But building “intelligent TVET” is missing from the reform agenda. An intelligent-based TVET model should be developed to bridge its curriculum with the industry’s needs. Key resolutions from the Asia TVET Forum 2018 are to enhance the 3As: Accessibility, Articulation and Accreditation. But what is lacking is the fourth A – Autonomy for TVET institutions. American philosopher of education, John Dewey argued that in order for education to flourish, it requires “substantial autonomy” for institutions, teachers and learners. You are currently browsing the archives for the Polytechnic and Vocational Education. category.